Four decades on, the Golf stands the test of time. There was a time when the ‘people’s car’ was the Volkswagen Beetle. But after years on the market, the model became outdated, and in the early 1970s demand began declining. Volkswagen was struggling financially and the need for a change was growing. After years of prototyping, the Golf was born. It became one of the few classless cars on the road. The model grew in popularity among everyone – even the Pope owned a Golf. Since the first one rolled off the production line in 1974, the model has gone through seven generations. And today it remains the most successful car in Europe. If you haven’t owned one, you without doubt know someone who has. But what’s the history behind the legend? Expectations were high. Volkswagen had to carry on the success of what until then was world’s most successful car. In the UK, that car also had to be ready to compete with the already-popular Vauxhall Viva and Austin Allegro. The demand for small hatchbacks was growing, so Volkswagen needed an appropriate answer. requirements. The Germans were impressed by his work done for Maserati, Fiat, BMW and others, and hired him to design the Beetle’s successor. Compared to the Beetle, the Golf was an absolute 180-degree turn. The Beetle had an air-cooled rear engine, while the Golf featured a water-cooled front engine. Unlike the Beetle’s rear-wheel drive, the Golf sported front-wheel drive. Plus Volkswagen switched from the well-known round shapes to a rectangular design structure. This new style was so well received that, within two years, Volkswagen had already sold one million Golfs. 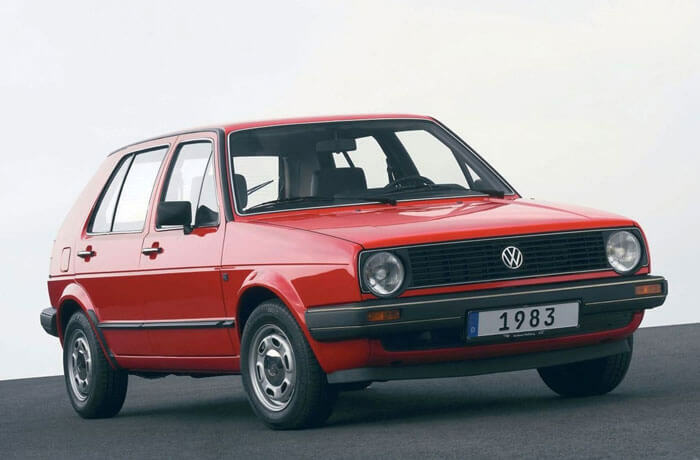 In 1976, the GTI edition was introduced, aimed at those who wanted extra performance. A convertible version was also produced. The first Golf laid the foundation for what was going to become a sensation among drivers around the world. It all began in 1974 with a revolution. The step from the Beetle to the Golf was revolutionary. A new vehicle layout was created based on the legendary design study by Giorgetto Giugiaro. After Volkswagen spawned the successful Mk1, they had to find a way to make the next generation even better. So, they didn’t change the exterior too much, but they made the Golf significantly bigger. This new chassis improved comfort, handling and reduced road noise. But the German manufacturer didn’t stop there. Volkswagen pioneered a number of new technologies with this new model. Golf Mk2 sported a controlled catalytic converter (in 1984), anti-lock braking system (in 1986), and all-wheel drive (in 1986). 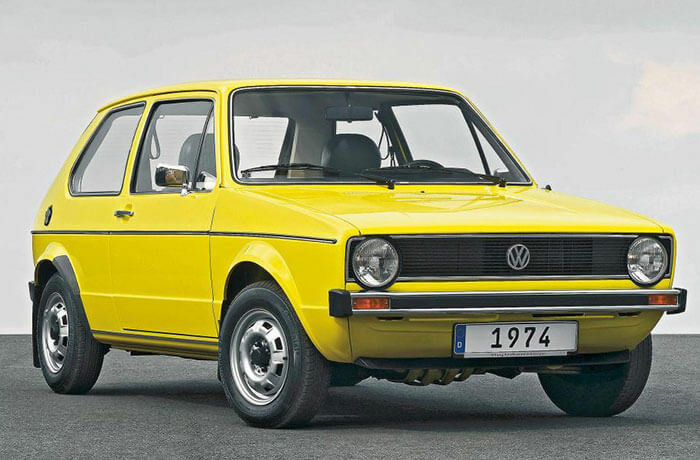 Volkswagen sold nearly 7 million Mk2s throughout its lifetime. And by 1988, the Golf broke the 10 million-cars barrier. It remained popular for its reliability which would soon become part of the Golf’s renown. It was the model which showed how continuous development can make a great car even better. The change from round to oval headlights is probably the first thing you’d notice. During the early 1990s, safety was becoming increasingly important to drivers. 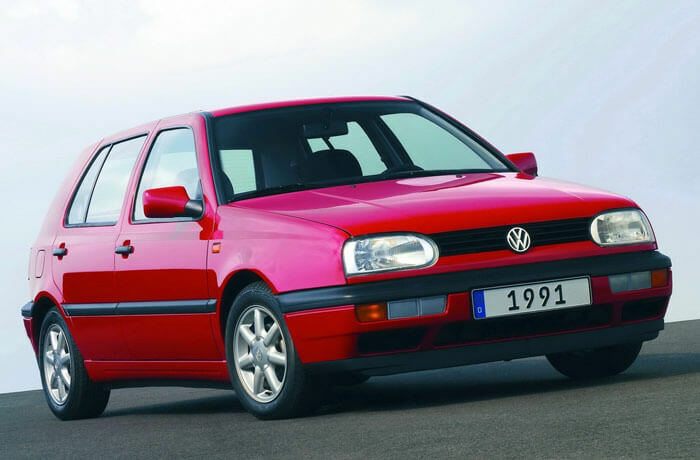 Starting from 1992, this Golf was the first of the model series to have front airbags. The construction of the car body introduced major advances as well. This improved Mk3’s crash safety and reliability. Anti-lock braking system (ABS) became a standard on all Golfs from 1996. Other features introduced in the Mk3 were cruise control and oxidation catalytic converters. The third generation also brought VR6, which was the first Golf with a six-cylinder engine. The growing demand for estates, with Vauxhall’s Astra Caravan was making its way to people’s garages, meant Volkswagen needed an answer. So, Mk3 brought the first Golf estate – the Variant. Volkswagen also introduced the Golf TDI in 1993 – the first compact car with turbo diesel direct-injection system, which made the TDI mark somewhat iconic. Hartmut Warkuß, then head of design, managed to create a worthy successor of the popular Golf. Mk4 set the design standard by which all successive models abided. 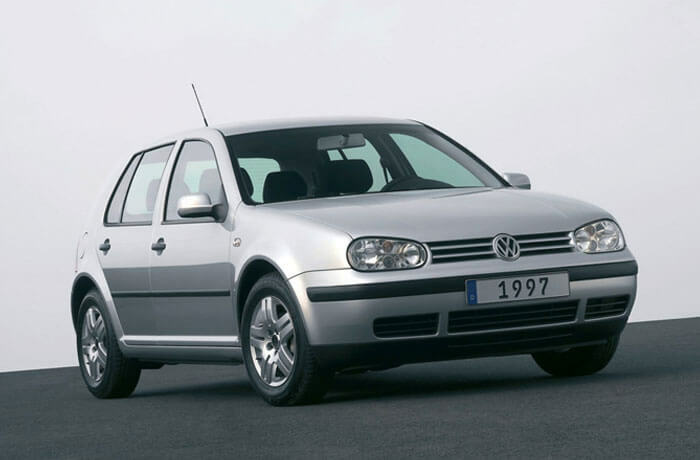 Today’s Golfs still carry design cues laid in the late 1990s. But this generation wasn’t just about the looks. Like with all previous editions, Volkswagen debuted new technology too. 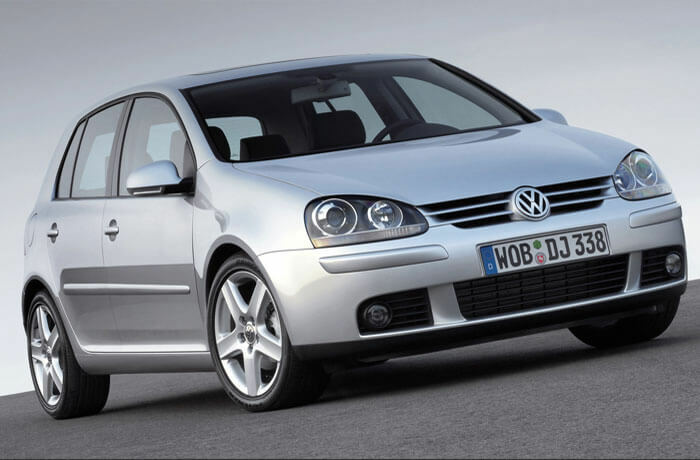 In 1998 Volkswagen unveiled the first all-wheel-drive Golf, called 4MOTION. It featured a Haldex clutch – an autonomous system which gathers information about the driver’s actions, engine performance, transmission and brakes. This significantly improved road grip. Continuing the safety trend, electric stability control (ESC) was introduced in 1998 and quickly became a standard feature. New standard head airbags debuted in 2002. This was followed by the revolutionary dual-clutch gearbox (DSG). Volkswagen decided the performance-focused GTI hot hatch wasn’t hot enough, so it launched the R32. This sported a big 3.2-litre VR6 six-cylinder engine, with a top speed of 155mph, reaching 0-60 in under 6.6 seconds. At the turn of the millennium, Golf remained a success, with over 20 million sales to date. 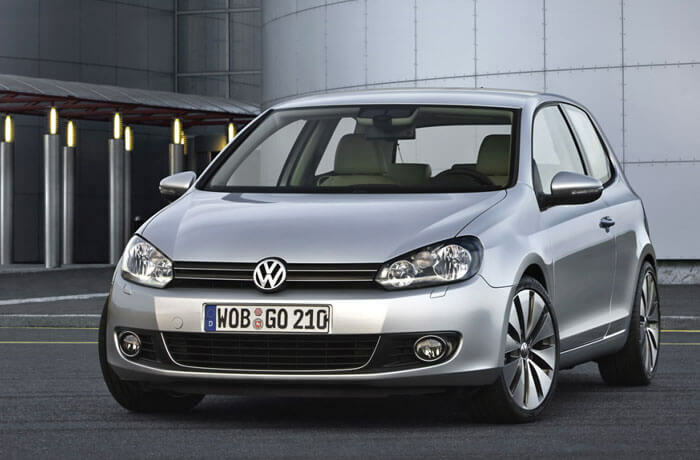 Volkswagen designers significantly modernised the looks of the next iteration of the Golf. Yet they didn’t lose its distinctive features, which made it still clearly recognisable. When Mk5 launched in 2003, there was a little pushback and sales were tough. To jump-start shifting the new Golf, Volkswagen decided to offer air-con as a temporary standard feature. Many customers also criticised the quality of the interior. And Volkswagen didn’t even paint half of the rear bumper. Nevertheless, in its lifetime, that generation achieved sales which other Golf competitors could only dream of. Performance-wise, like with previous generations, it didn’t disappoint. Mk5 sported a new four-link rear suspension, seven-speed DSG, and world’s first twincharger (in the 2006 TSI edition), which combined turbo and supercharger. Volkswagen set the fuel-saving strategy with the BlueMotion Polo in 2006. A year later the Golf received the fuel-efficient BlueMotion treatment as well. This new economical Golf returned over 62mpg, which is still impressive by today’s standards. When the Mk6 was introduced, it quickly became clear that Volkswagen had learned from past mistakes. The new generation offered refinement and improved on what made Golf a successful car. The first thing was safety - the stronger laser-wielded bodywork and improved safety technology resulted in a five-start safety rating from EuroNCAP. It came with a refined ESC, park assist and adaptive cruise control. Mark 6 was, in fact, the most advanced Golf to date. Volkswagen didn’t cut corners this time around and improved the interior to address the criticism Mk5 spurred. A second Golf BlueMotion was produced with a combined mpg of 74.3, which at the moment puts it into the cheapest VED tax bracket. The R was introduced in 2009 as a continuation of the powerful R32. It came with a 2.0-litre TSI turbocharged engine, which could do 0-60 in just 5.5 seconds (for DSG-equipped models). The R also sported an improved Haldex 4motion all-wheel drive system. This new Golf also introduced sharper stark features, and like with predecessors, it didn’t change the formula too much. Yet again, the engineers at Volkswagen found ways to improve the body of the car. The weight of the Mk7 was reduced by up to 100kg. Fuel consumption and emissions were reduced by up to 23% as well. The slightly longer and wider build brought greater shoulder and leg room for the passengers inside. The model won several awards, among of which European Car of the Year (2013), World Car of the Year (2013), North America Car of the Year (2015). The Golf Mk7 will go down in history as the compact car in which numerous new assistance systems made their debut. Features like automatic post-collision braking system, PreCrash preventative occupant protection, and driver fatigue detection were all now premium car features. The Golf remained a great-value-for-money car. By the summer of 2013, Volkswagen had sold 30 million Golfs. This is about 2,100 car sales each day for 39 years. 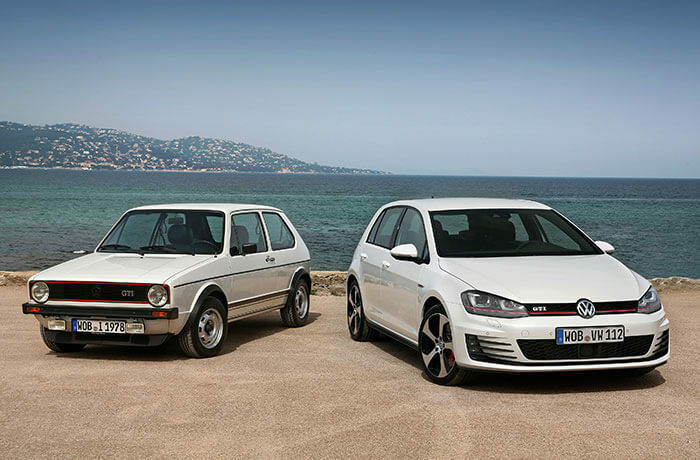 Forty years on, the DNA of the first model remains unchanged - from the highly recognisable exterior and shapes, to the core characteristics of the Golf. Volkswagen created a car which was reliable, safe and had enough performance options to satisfy even the pickiest of the bunch. Although the emissions scandal caught Volkswagen with their pants down, people still buy their cars. And seems like nothing can stop the Golf. First published 27 September 2016.